A small flock for eggs and/or meat production can be easily maintained by a family. Initial expenses will include the cost of building or obtaining a ready-made building for a coop, some fencing, and miscellaneous lumber for nest boxes and ramps. There are many books (see Resources for some examples) with good information on how to calculate start-up and maintenance costs for both meat birds and egg-layers. 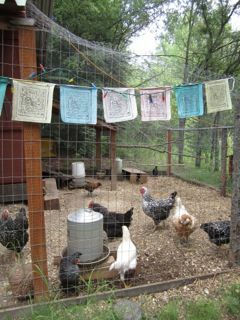 The UAF Cooperative Extension Service is another excellent resource for small poultry operations; Home Laying Flock (LPM-00343) summarizes all you need to know – from the amount of space need per bird, to brooding chicks to how to feed your birds to keep them healthy and productive. 8 Responses to Before you start…. Does having a chicken coop attract larger animals such as bear or wolves? It depends on where you live. Bears have been known to come into chicken coops- especially in areas, like Dillingham and SE Alaska that have a high population of bears. In Interior Alaska/Fairbanks area, it is less of a problem, but still poses one. If you do decide to keep chickens, take the same precautions as you would with any other food sources (including bird seed, dog food, trash). Keep the are around your coop clean and free of a lot of grain and other food tidbits, secure and store your chicken feed in a place where bears cant easily smell or get to it. I cant answer the question about wolves. I have not heard of chickens being a particularly strong attractant – wolves are fairly shy and probably would not, in their normal habit, come into a yard because of a chicken coop. Coyotes are more likely, and foxes, definitely. Hi! I have had good success with barred rocks, rhode island reds, wynadottes (my favorite), and australorps. Any heavy-bodied breed with rose combs or other short, close to the head type combs work well in cold winters. The key to having eggs throughout the winter is to make sure that they have at least 10 to 12 hours of light daily. You will have to augment natural light in your coop with artificial light – you can put the lamp on a timer so that it comes on and off automatically. Be sure the light is mounted somewhere where the chickens cant fly into it or knock it over. Good luck! Thank you for the tips! Do your chickens go outside much in the winter or do they mostly stay in their coop? They never go outside in the winter – even if we get relatively warm days (and we have had of late some above freezing even in January). It is not the snow – because come March – when the days warm up, they do go outside – into an area that I keep clear of snow. My theory is that it has to to with the low angle of the sun up here. My henhouse is in a place where when the sun is low on the horizon, it is not visible through the trees, so my (unscientific) theory is that my chickens think it is dusk, even at midday, and think it is time to be in their roost. Also, it is not energy efficient to leave the small bottom coop door open during winter days, as then it just takes more energy (and $) to keep the chicken house warm. Some flock keepers throughout Alaska do have birds that go outside in the winter….if it is warm enough. But even at 20 degrees or so, you have to keep an eye on them for frost bite. I have had some get pretty severe frost bite being outside at 20 degrees – so that is another reason to limit it, if not eliminate it, until warmer late winter days. Wow, they must go crazy being cooped up (oh!) all the winter. So before you started using the light more were they just sleeping most of the time because it was dark, like being in a semi-hybernative state? No, not really – the hen house is large enough for them to move around in. Egg-laying in chickens is affected by the light cycle. It is not that they go into a semi-hibernative state – as they are quite active and all of that – even without a lot of direct sunlight – but in order for them to not interrupt their egg-laying – they need a consistent source of light that mimics the sun-up/sun-down cycle – of roughly 8 to 10 hours. It is better to give them about 10 to 12 here. If you dont put them on artificial light in the winter, they will stop laying. A general backyard poultry book will give you all of the info you need about this.